James Hall scored 91 not out as Waringstown won their second trophy in the space of three days by retaining the Twenty20 Cup with a seven wicket win over North Down at The Lawn on Sunday. 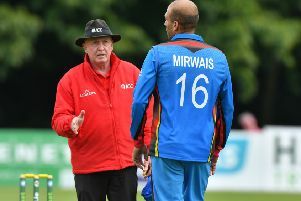 Just like in Friday’s Challenge Cup final, Waringstown captain Greg Thompson elected to bowl first on the same wicket that was used for the Twenty20 Trophy earlier in the day. They struck early when Alistair Shields was well caught by Shaheen Khan off the bowling of Phil Eaglestone with the score on 19, bringing former professional Ruhan Pretorious to the crease. He built an important partnership with Ryan Haire, with the pair scoring at a healthy run-rate and both moved into the thirties, with the only scare coming when Haire was dropped at mid-off. Haire was first to go when he was caught by James McCollum for 37 at deep square leg, giving Nelson his first wicket of the day. When Peter Eakin was caught first ball by Marcus McClean, it halted any North Down momentum, leaving the score at 82-3 in the 12th over. Pretorious was always going to be a key wicket, and sitting on 38 from 31 deliveries, he attempted a reverse sweep off Nelson and was bowled, and from that moment they were always likely to fall short of any meaningful target to challenge the hosts. Nelson ended with 4-18 from his four overs, again proving to be a vital cog in the Waringstown bowling attack, with the all-rounder now nearing 30 for the season. Some late order hitting from Ross Ewing (15), and six runs added to the total for a slow Waringstown over rate, North Down ended their innings on 143-7. Adam Dennison, fresh off his match-winning century in the Challenge Cup final on Friday, opened with James Hall, and continued in a similar vein, opening the scoring by crashing a four through point. The duo got Waringstown off to a quick start most weeks, with Hall taking charge of the scoring this time round, hitting the first six of the innings over deep square leg, and then produced the shot of the day as he drove Pretorious for four over mid-off. The 50 partnership was brought up in the seventh over with a Dennison four, and the home side were confidently striding towards yet another piece of silverware. With 1000 runs for the season looming, Dennison was caught at deep mid-wicket by Nelson off the bowling of Haire for 31 with 51 more needed for victory. Haire was reintroduced into the attack in the 16th over and struck twice in the consecutive balls, first having McCollum caught at short fine leg before trapping Greg Thompson lbw, ending with figures of 3-26. Khan helped see the side home alongside Hall who finished on 91* - an innings containing 12 fours and three sixes from 62 balls. It was as destructive as it was classy, with a mix of big maximums and perfect drives. The current Waringstown team are now reigning champions in five different competitions - which is really remarkable. Their attention will now turn to league action, where they will again face North Down next Saturday before travelling to league leaders CIYMS on Sunday - a match which could go a long way to determining who wins the title.